The Meriden Room Collection consists of Meriden histories, maps, telephone books, city documents, city directories (1868 – 1992), Connecticut town histories, military histories, genealogies (printed and CD), genealogy periodicals, newspapers, high school yearbooks (1892-present), books by local authors and an extensive clipping file on local topics. Donations are welcome with the understanding that materials the library cannot use may be disposed of at the discretion of the librarian. The purpose of the Meriden Room is to collect, preserve and make available for public use, books and materials relating to the history of the City of Meriden, Connecticut. Connecticut town histories are also part of the collection. To use the history room you may register at the Information Desk. Materials in the Meriden Room do not circulate. Since many items are fragile please check with a librarian before photocopying. Index to Barbour Collection of Meriden vital statistics, 1806-1853. Sanborn Fire Insurance Maps of Meriden, 1884-1950. Meriden newspapers, 1863 to present. Ancestry Library Edition is available for use in the library. The Connecticut State Library offers other resources including: Heritage Quest. Available for use in the library and remotely. There may be a minimal charge of $5.00 for Historical and Genealogy research when papers need to be printed out and mailed. The amount will cover: paper, toner, and postage. Meriden Ornaments have been produced by the Meriden Public Library Local History Department since 1994. 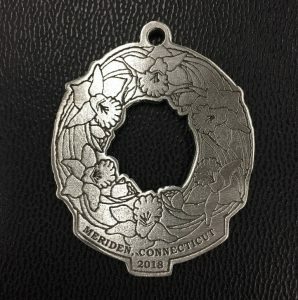 Each pewter medallion is manufactured by Woodbury Pewter and features a Meriden historical landmark. All proceeds are used to purchase books, periodicals, archival supplies, and other local history items. For additional information contact the library's information desk at 203.238.2346.